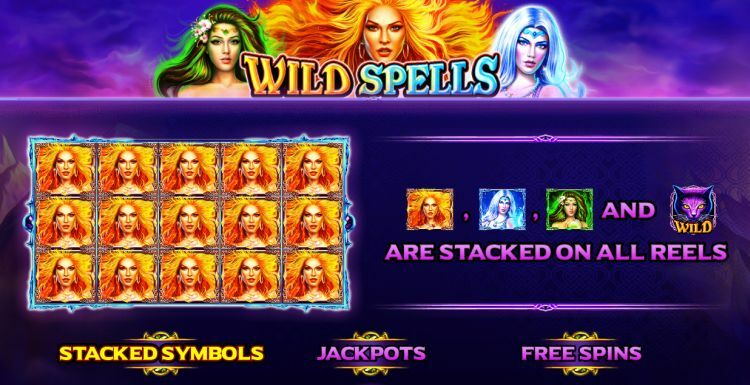 Wild Spells is another great release from Pragmatic Play which features a unique stacked wild bonus and 3 huge jackpots that are waiting to be won. This 25 pay line, 5 reel slot offers beautiful graphics, a Return to Player of 96.4% and a medium variance. All the ingredients you need for an adrenaline-pumping video slot experience! How does Wild Spells work? 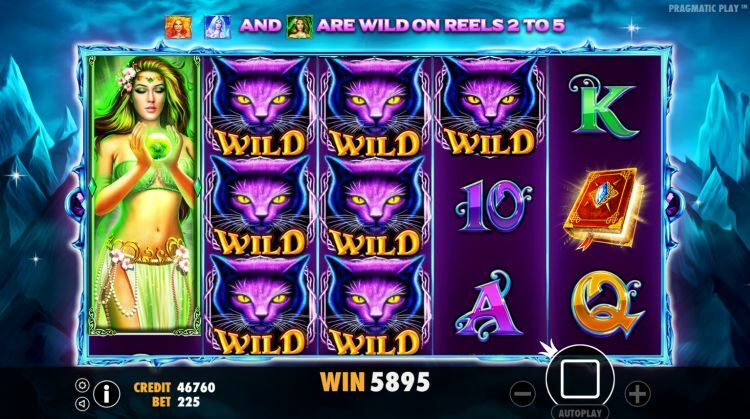 Wild Spells is a 5 reel game with 25 fixed pay lines. The minimum bet is €$0.25 per spin, and the maximum bet is €$125 per spin. This makes this slot suitable for both the high stakes player as the casual, low betting player. The fantasy-themed slot centres around 3 beautiful Witches that appear in stacks. These Witches are the premium symbols of the game and pay between 200 and 100 coins for a 5-of-a-kind. They also play an essential part in providing the player with the huge wins, both during the base game as well as during the free spins. Other high paying symbols are the potion, the spell book and the candle, all day to day items in the life of a Witch. The Black Cat symbol is the Wild Symbol and substitutes all other symbols except the Scatter Moon symbol. The lower paying symbols are the obligatory card symbols 9, 10, J, Q, K and A. These pay 30 – 40 coins. During the base game, every spin will give you a chance of winning one of the 3 jackpots. All you need is to line up multiple full stacks of the same Witch (from left to right), and a lot of luck. 3 or more scattered Moon symbols trigger the free spins bonus. In true Pragmatic Play style, you may select the number of free spins you want to play. During the free spins, all Witch symbols that appear on reels 2, 3, 4 and 5 are turned into Wild Symbols. The lower the number of free spins, the more Witches become wild. 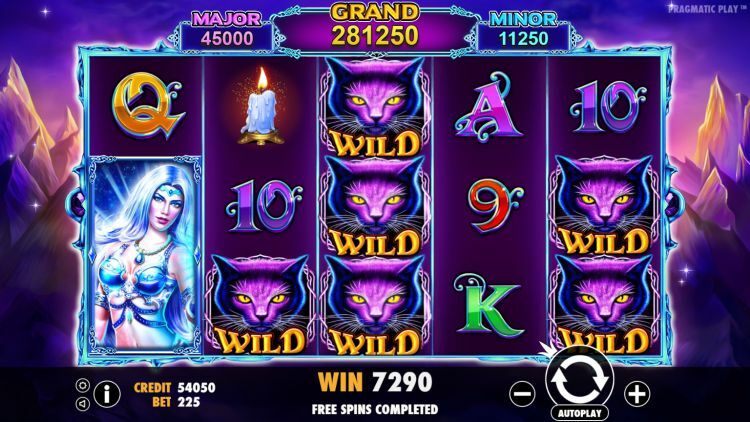 Due to the extra wilds and stacked symbols, this free spins bonus has a lot of potential and rarely disappoints. The free spins can be retriggered, and the jackpot feature is not active during the free spins. 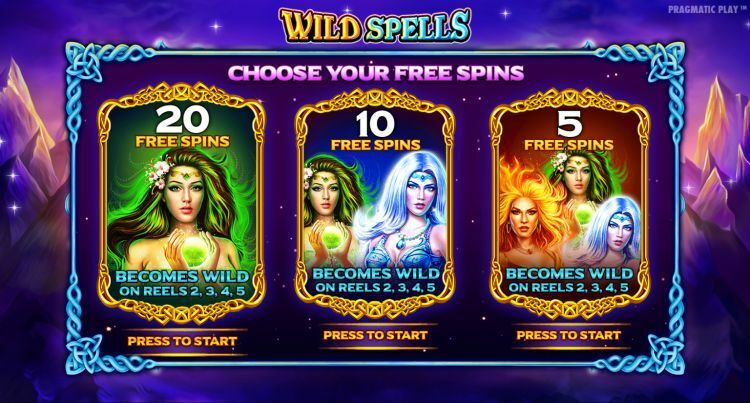 Wild Spells is a beautifully designed slot with some cool and unique features. The 3 jackpots that can be won during the base game are particularly appealing, with a top jackpot of more than 30,000 coins. The RTP of 96.4% is decent enough, and although it is not enough to make our list of best-paying slots, it offers a good payback percentage. You will find Wild Spells at plenty of reliable Australian online casinos. One casino we recommend you try is Spartan Slots Casino, which offers Australian players hundreds of the latest and most exciting slots. Play all your favourite online slots from respected game providers such as Betsoft, Habanero and Pragmatic Play. New players get a 200% bonus up to €$2,000 at Spartan Slots.